Birtley replica garage door T handle in Silver finish with four front fixing holes. Has a 70 x 64 mm face plate with four 5mm CSK fixing holes spaced 40mm horizontally and 46mm vertically. 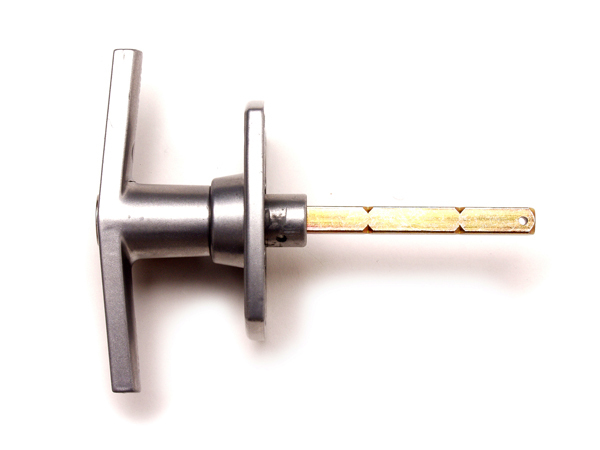 Square 8mm spindle with a length of 76mm which can easily be cut down to match the length of the original. Supplied with 2 keys, 4 nuts and bolts. Note: It may be neccessary to enlarge the central hole in the door to accept this replacement handle due to a design change.